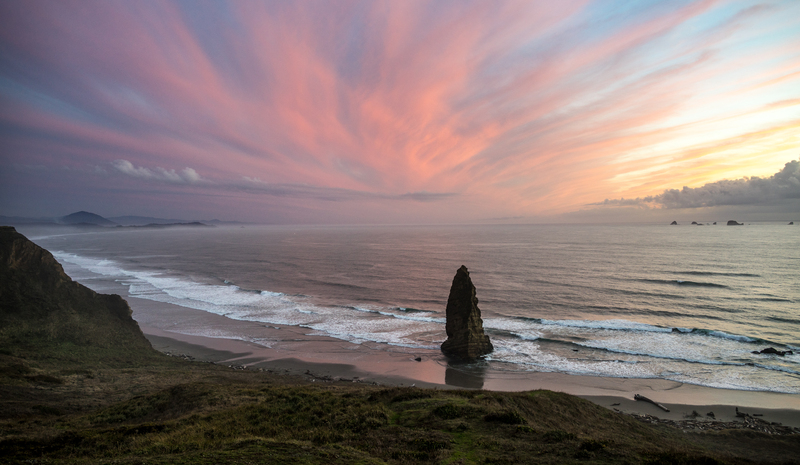 The southern Oregon Coast holds some of the most spectacular remote scenery in the state. Less visited than the northern beaches, visitors here are treated to incredible views without the crushing crowds. Windswept overlooks, grassy bluffs, crashing waves, and the ability to see all the way to California are just a few of the reasons to make the drive. The hikes we've gathered here showcase the best beach trails in the region. Be sure to bring your camera, there are so many lovely opportunities for the perfect shot. Soon the first views to the south appear on the Cape Sebastian Trail. Photo by Denis LeBlanc. Cape Sebastian provides views to some of the least visited and most scenic portions of the Oregon Coast. The magnificent trail down to the beach on the north side of the cape is a high point of this region. With a gradual descent and inevitable switchbacks, views to the north are jaw dropping at the start of the hike. Further on, the views to the south open up to crashing waves and beautiful bluffs. To reach the beach at Hunters Cove in the final section, rope and posts are present due to the steepness of the trail. Hunters Beach is a popular surfing spot for locals. While the return hike is all uphill, the incredible scenic views make it enjoyable. One-way travel is possible, however, if a car is left at the highway parking turnout at the southern end of the 1-mile stretch of Hunters Beach. The nearby Samuel H. Boardman Scenic Corridor is also worth exploring. Sunset at Cape Blanco. Photo by Denis LeBlanc. 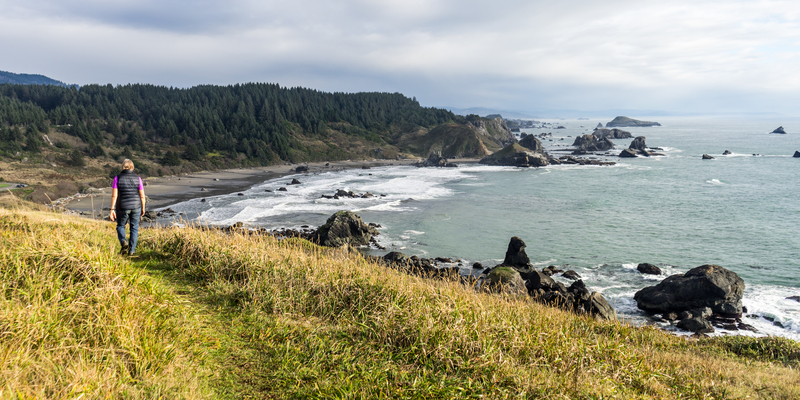 The Oregon Coast Trail system winds through Cape Blanco State Park and offers a few segments that are easy and incredibly scenic. The Cape Blanco Shore Trail meanders from a small clearing along the beach access road, up to the lighthouse gate, and onto a small beach on the north side of the cape. Occasional views of the ocean are available through trees edging the bluff. Small spur trails allow hikers to get unobstructed views at the bluff edge. Caution should be exercised along the cliffs. Once the trail reaches the beach, the views along the shore toward the Sixes River mouth are stunning. Check the local tide tables before heading out as there is little beach available at high tide. A special treat here is the view of the lighthouse in the distance; its blinking light is visible even in full daylight. From the Cape Ferrelo Trail in the Samuel H. Boardman State Scenic Corridor, Lone Ranch Beach can be seen below. Photo by Denis LeBlanc. Samuel H. Boardman State Scenic Corridor is 12 miles of wayside along Highway 101 that is filled with a network of trails, including 27 miles of the Oregon Coast Trail. Visitors will find a rugged coast with seemingly endless viewpoints of off-shore sea stacks topped with old-growth Sitka spruce. One of the best short hikes at the southern end of the Samuel H. Boardman State Scenic Corridor is the short hike around Cape Ferrelo. Starting in low trees and brush, the trail gives way to rolling grassy bluffs with outstanding views both north and south. On the south side of the cape, views of Lone Ranch Beach and beyond to California are available. A spur trail branches off, leading to Lone Ranch Beach. Secret Beach, accessible via a short three-quarter-mile trail, is a perfect place to experience solitude. A creek pours down the steep hillside along the trail, ending in a waterfall that plunges into the sand. South of this creek, the beach stretches around a point that can only be accessed at low tide. 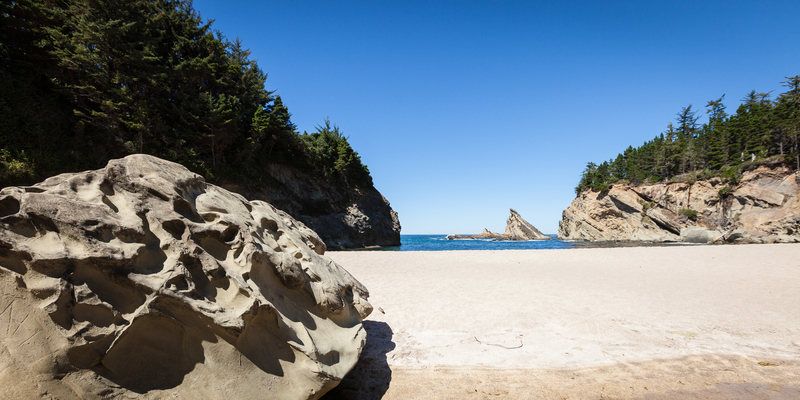 While visiting Secret Beach, be sure to take the side trip to discover Thunder Rock Cove. 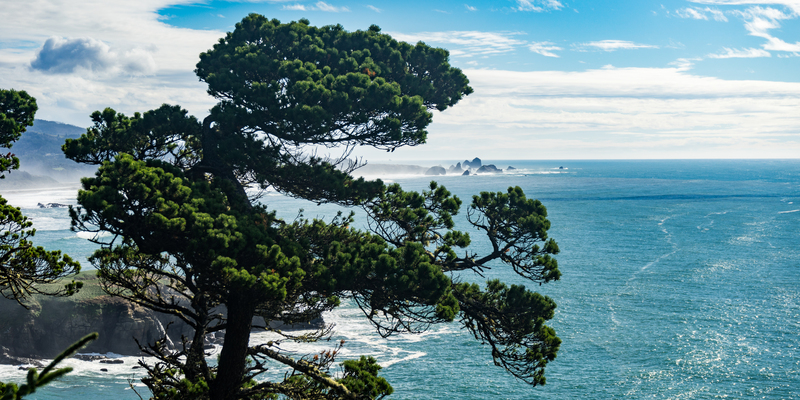 You can hike a delightful section of the Oregon Coast Trail from here to Spruce Island and back in 3.2 miles. Natural Bridges Viewpoint is accessible by an unmarked trail originating from an unmarked parking area. These seven arched sea stacks are possibly the most recognizable in the park, and for obvious reasons. The waves crash against these impressive rock islands and up and through some blowholes, creating a dramatic experience for all the senses. Take care at this viewpoint as there is not any railing to prevent one from falling down steep cliffs into the water. Simpson Beach. Photo by Halvor Tweto. Shore Acres is a wonderful state park on the Oregon coast, and it is especially popular for its botanical garden, modeled after the original English-style gardens of the Simpson estate that was established on the site in the early 1900s. Leaving from the southwest corner of the parking area, the trail first climbs down to Simpson Beach, which is great to explore, then climbs back up to the top of the bluff. The trail provides great views of Simpson Reef to the south where the sound of barking sea lions can be heard. The views of Simpson Reef get closer as the trail reaches the parking area and overlook. From this point it is another half mile to the Cape Arago point, but much of the trail is adjacent to the highway. The New River. Photo by Halvor Tweto. Geographically, the New River must be one of the oddest waterways on the Oregon Coast. A joining of three waterways, the New River is comprised of Willow, Jims, and Floras Creeks. Willow Creek joins Jims just over a mile from the beach. Finally, Floras Creek, the north-flowing outlet for nearby Floras Lake, joins the stream merely a quarter mile from the surf, give or take a high tide. Then, incredibly, this trio of waterways turns sharply north, becomes the New River, and wanders for about 9 miles on a north course parallel to the Pacific before it finally swerves into the surf. Designated an Area of Critical Environmental Concern by the BLM, the New River and the surrounding zone have been recognized as irreplaceable habitat for several rare species of flora. The loop consisting of North Trail, Ocean View Trail, West Muddy Lake Trail, and East Muddy Lake Trail is approximately 3 miles and is very doable for family members of all ages. The road to the boat ramp bisects the loop, so a return shortcut is always close by. If you have a little extra time and energy, check out the Old Bog Trail for a glimpse into the history of the local cranberry industry. Once the Floras Lake Trail meets the Oregon Coast Trail, vegetation becomes more dense. Photo by Halvor Tweto. Floras Lake is well known as a destination for fans of wind-powered water sports due to the strong coastal winds that frequently whip across this freshwater body. Floras Lake is also part of the New River Area of Critical Environmental Concern. Snowy plovers nest nearby, and the lake also receives annual traffic from migrating Aleutian Canada geese. The Floras Lake Trail is an excellent walk through this unique habitat. The trail crosses Floras Creek, said to have formed the New River channel during a high water event in 1890. 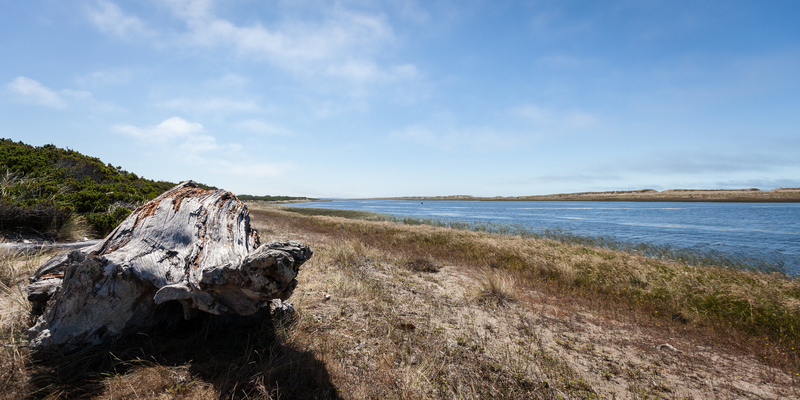 Once you're on the sand trail that winds around Floras Lake you’ll have the chance to break off from it the and reach the ocean after only a half mile, or you can continue down to another small beach access trail approximately 0.8 miles from the trailhead. 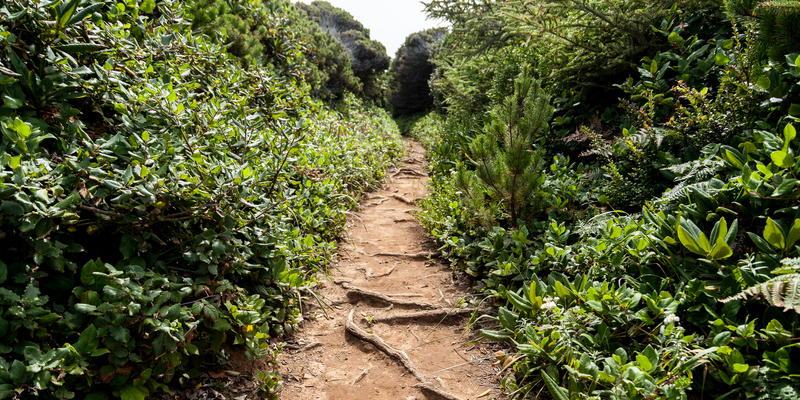 If you are looking for more to explore in the area, the Floras Lake Trail connects with the Oregon Coast Trail as it leads into Floras Lake State Park. Here you can follow the path as it plunges into the thicker coastal canopy. If you decide to return from any of these points along the beach, be very aware of protected snowy plover habitat. Many areas along the beach are closed from March 15 through September 15 to protect this endangered species.